The large TFT colour display of the Aastra 620d provides clear graphic displays and ideal legibility even under difficult light conditions. Many freely programmable keys support the simple navigation and the use of different lines. 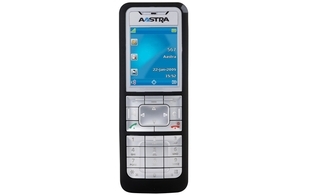 Equipped with a Bluetooth interface for a cordless headset, Aastra 620d allows maximum freedom of movement. The high-quality lithium-ion battery can be charged via the USB interface, independently of the charging bay.